Sidereal Time. Even though Sidereal Time is a more accurate measure of the Earth’s rotation, we normally use Solar Time for time-keeping because the Sidereal Day is not a practical unit for us to use. On the other hand, Sidereal Time is important because it enables us to find the hour angle of a star and is therefore essential if we wish to use stars for navigation. Solar Day. A Solar Day is the time interval between two successive transits by the Sun across the meridian directly opposite that of the observer; that is the 24 hour interval from midnight to the following midnight at the observer’s meridian. Sidereal Day. A Sidereal Day is the interval between two successive transits of a star across the observer’s meridian. A Sidereal Day is shorter that a Solar Day by approximately 4 minutes and is a true measure of the period of rotation of the Earth. For convenience, the First Point of Aries is used to mark the Sidereal Day instead of an actual star. The Sidereal Day is therefore defined as the interval between two successive transits of the First Point of Aries across the same meridian. The Sidereal Day begins when the First Point of Aries crosses the meridian. Local Sidereal Time is equal to the Local Hour Angle of the First Point of Aries. This is abbreviated to Local Sidereal Time = LHA of Aries. 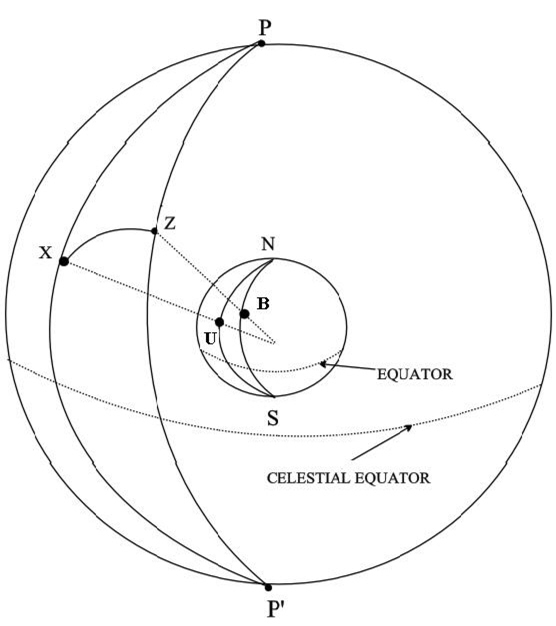 Just as the Greenwich meridian has been arbitrarily chosen as the zero point for measuring longitude on the surface of the Earth, the first point of Aries has been chosen as the zero point in the celestial sphere. It is the point at which the Sun crosses the celestial equator moving from south to north (at the vernal Equinox in other words). So the First Point of Aries is the starting point of the Solar Year and it is also the starting point of the Sidereal Day. The confusing thing about the First Point of Aries is that, although it was in the constellation of Aries when it was chosen by the ancient astronomers, due to precession it now lies in Pisces. Due to the Earth’s rotation, the Sun moves through 15o of longitude in 1 hour and it moves through 15 minutes of arc in 1 minute of time. So the angle ZPX can be measured in terms of time and for this reason, it is known as the Local Hour Angle. Sidereal Hour Angle (SHA). SHA is the angle between the meridian running through the First Point of Aries and the meridian running through the celestial body measured westwards from Aries. The Nautical Almanac does not list the GHA of the stars; it lists their sidereal hour angle (SHA) instead. So, the GHA of a star has to be calculated from the GHA of Aries. Therefore, the SHA of the star must be added to the GHA of Aries in order to obtain the GHA of the star. A comprehensive exposition of this topic can be found in the book Astro Navigation Demystified. This entry was posted in Uncategorized and tagged astro navigation, astronomy, celestial navigation, navigation, Sidereal Time, Time. Bookmark the permalink.